VHT provides a multi-high performance coating system for the ultimate in protection and quality. The system includes surface preparation, primer, paint and clear coat. VHT 550°F (288°C) Engine Enamels™ are available in a wide range of colors, including exact match factory colors. All colors have excellent durability and superior heat and chemical resistance. They are specially formulated to withstand corrosion, rust, salt spray, chemicals and additives of today’s gasoline blends and degreasers. 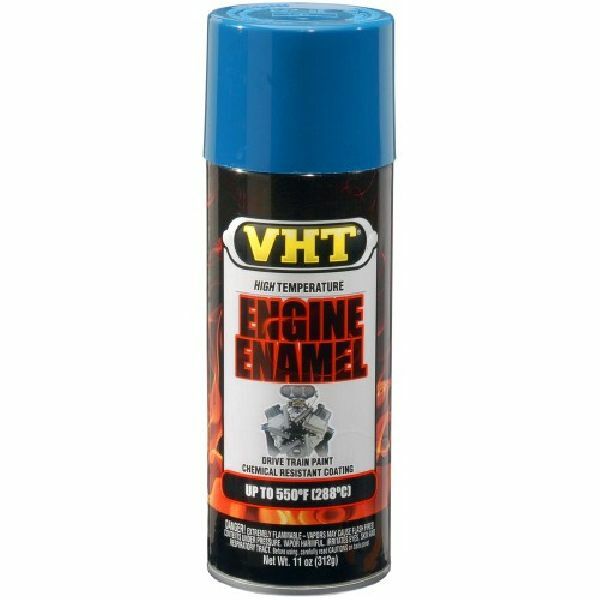 VHT 550°F (288°C) Engine Enamels™ are a unique blend of urethane and ceramic resins, which produce a tough and long-lasting finish for engines, engine accessories or wherever a tough durable heat or chemical resistant finish is needed. Dry Time: Dries to the touch in 30 mins. Dries thoroughly overnight. VHT Engine Enamel only attains its unique properties after correct curing. Bake at 200°F (93°C) for 20 minutes. The inherent heat of engine operation will also accomplish curing.